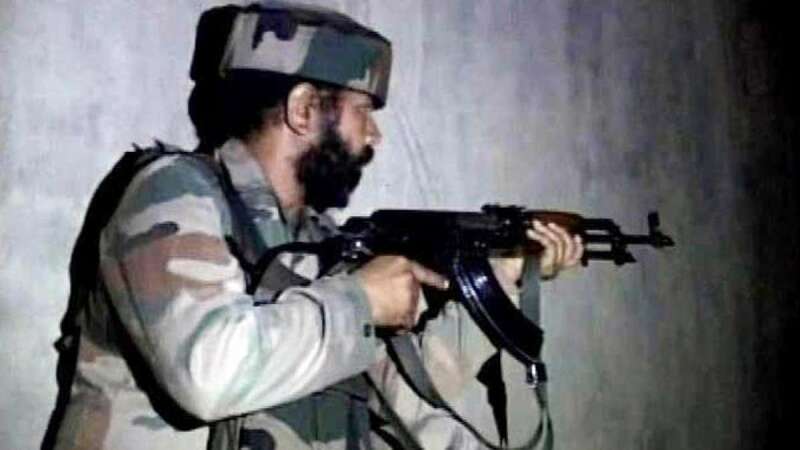 Baramulla : Four days after Indian Army neutralized 7 terror launch pads near Line of Control, militants on Sunday night targeted army and BSF camp in Baramulla. One soldier has been martyred and another has been injured in the attack. A heavy exchange of gunfire came in front as terrorists gained access to 46 RR camp through an adjoining BSF camp. During the firing, two jawans were injured who were rushed to a nearby hospital. One army man succumbed to his injuries at the operation table. # Terrorists attacked a BSF and adjoining army base camps in Baramulla district in Srinagar. # Out of two injured army men, one has succumbed to his injuries. # Illuminators were also fired by the army in the sky to locate the terrorists. # Former Jammu and Kashmir chief minister Omar Abdullah meanwhile tweeted: "Colleagues in Baramulla town are phoning with reports of massive gunfire in their vicinity. Prayers for all in the area." Colleagues in Baramulla town are phoning with reports of massive gunfire in their vicinity. Prayers for all in the area. # Four days back India had carried out surgical strike, destroying nothing less than 7 terrorist launch pads along Line of Control.